The Circus documentary film crew, led by directors Maro Chermayeff and Jeffrey Dupre, stuck with the Big Apple Circus for a year, shooting 2000 hours of footage that they then pared-down to these six hour-long episodes. Starting with the creation of a new show, Change On, led by the ebullient and unflagging director Steve Smith, the film follows the built-in narrative of the bigtop season – putting the show together, the premiere, the tour, the inevitable changes and disruptions, eventually through to the final performance – and around this larger frame it weaves the myriad personal stories of the people who work on or orbit the show: the tent crew, the creative team, the performers, the children. 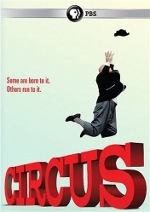 With six hours to work across they manage to develop a couple dozen characters and to unearth the hard truth of their motivations: there's a depressive clown who sleeps odd hours and walks the ring at night; two all-American identical twins whose juggling act is breaking apart as one pursues his ambition of attending medical school; a young handbalancer, born into a circus family and into the performing life, who dreams of getting away; a wheel of death acrobat who recast himself as a dog trainer after a terrible accident; and, not least, Big Apple co-founder Paul Binder himself, going through a difficult transitional period as he steps down as artistic director. The ring crew – who describe themselves (not unamiably) as the circus' underclass, the 'serfs' – are a roiling Dickensian landscape of human failure and glory and desperation and drama, and in among their clashing, tangled storylines the filmmakers find space for some surprisingly delicate moments: a grizzly raincoated tentmaster talking to his tent in a storm; wirewalker Sarah Schwarz working on her act under the sharp eye of mime Olivier Taquin; the children of the circus sharing their dreams on the last day of term. It's an extremely impressive feat of compression and organisation, a long, strange look into a rarefied and unique world, and a picture within a picture of the entertainment industry at a time (2008-2009) when the whole subprime mortgage mess was spilling out of the closet and into the public domain. Recommended.